UPDATE: We have a winner, folks! Congrats goes out to Mr. Dylan Fairbairn, the lucky winner of all this swag — Dylan, my team will be in touch to get you your loot! Today I’m excited to be the first to share with you a piece of game-changing technology that will help new AND established cinema / video camera operators capture world class moving pictures in the most intuitive, simple way that I’ve ever imagined. And if you read to the bottom of this post, you’ll see I’m giving you a chance to win this gear valued at ~$5000. Over my career in the photo and film industries, I’ve had the good fortune to collaborate behind-the-scenes with many of the brightest minds, top brands, and most innovative products. Among those I count experiences with Apple on iPhone and other products, with Nikon on the world’s very first video DSLR (D90), Ustream and now Meerkat and Periscope on live internet broadcasting and…well…drones, software, computers, etc…game changers that completely re-defined entire industries and — most importantly from my perspective — they share the common thread of having led to the democratization of creativity. 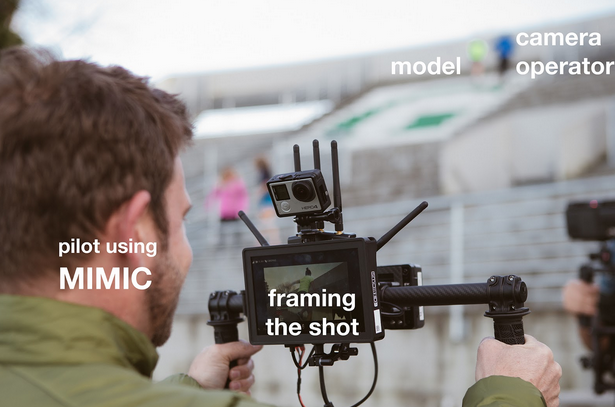 MIMIC represents a completely intuitive and organic way to control a cinema / video camera remotely… NOT the camera settings…but what the camera actually sees and records. You’re familiar with the concept of a steady cam, right? Consider that, with this product, you can now operate a stabilized camera remotely, right from your director’s chair with a simple-to-use device that track your movements and translate them into smooth, precise camera moves. MIMIC with Chase Jarvis from Freefly on Vimeo. The genius minds behind MIMIC are Freefly Systems… the same minds that more than 6 years ago I was hiring to fly custom, camera-carrying drone helicopters. The same people who 2 years ago created the MOVI system — a handheld digital stabilized camera gimbal, so advanced, it completely redefined camera stabilization. 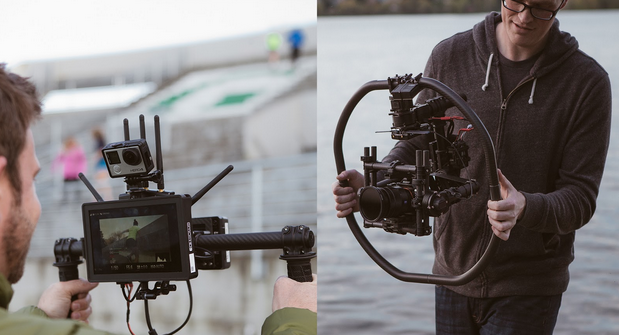 MIMIC is their newest breakthrough product and it’s launching tomorrow at NAB. But you got to see it here first. MIMIC with Jett and Kaia from Freefly on Vimeo. The MIMIC configuration pictured here in these videos is just but one configuration…. the sort of “steering wheel” style where the pilot remotely drives the camera gimbal like a video driving- or flying-game… But imagine if you will another configuration I also was able to use in preparation for this launch… one where I was able to pilot the camera with a set of VR-like glasses. YES, I’M DEAD SERIOUS. Just sitting there in my director’s chair I was able to control the camera with being held by my operating counterpart simply by moving my head in space left, right, up and down in space. I could see exactly what the camera was seeing and was able to steer the camera with nearly flawless precision by simply looking at the feature in the scene I wanted to see. Anywhere I looked, the remote camera (held by my camera op counterpart) would track exactly to that framing. Wow. This truly is the future. SSSOOOOOOOOOO…. yours truly + CreativeLive and Freefly Systems are making it possible for one winner to take home an insane gear package.. That winner could be you. MOVI m5. This is the digital 3-axis, gyro stabilized handheld camera stabilizer that transformed camera movement over the past 2 years We are including the M5 in a bundle with a bunch of other tasty gear, pelican case etc etc. Check it here. To enter just fill in your info below and follow along. And note: this giveaway is live TODAY all the way through the 12th of May. Winner will be announced on May 13th via the @CreativeLive @ChaseJarvis + @FreeflyCinema social feeds. Good luck to you!